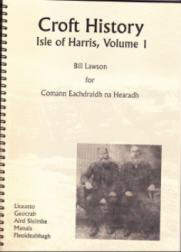 For this first volume of the Croft Histories of Harris, we have started on the Bays of Harris, beginning in the village of Liceasto (Likisto) and moving south through Geocrab, Aird Sleimhe (Ardslave) and Manais (Manish) to Fleoideabhagh (Flodabay), so covering the whole of the old Manais School area. All of these villages date from the 1790s, the period when Captain Alexander MacLeod of Bearnaraigh encouraged people to settle in the Bays as a part of his scheme for the development of fisheries on the island. The author has tried to cover the history of each croft from that time to the present day, though it has not always been possible to identify the earliest tenants with complete accuracy. Spiral Bound, 144 pages.